Sometimes embracing the Filipino culture can be a challenge. I think my husband (German and Irish and other European descent) is more Filipino than I am – especially since he will try things such as Balut. What’s Balut? Balut are fertilized duck eggs that are at the stage of development where there is a developing embryo inside. The embryo is normally around 17 days old. The egg is boiled and usually eaten with salt, just like a normal hard boiled egg….but there is nothing normal (to me) about feet sticking out of my egg. Yeah, I couldn’t do it either…it was hard even watching my husband eat it. YUCK!! No – I would NOT ever, ever, ever even THINK about trying it!! No. No, no, no, no. Just no. Ew. Eww and nope, this is as bad as those jarred pickled pigs feet – just yuck! Saw this blog post via Lisa’s tweet. 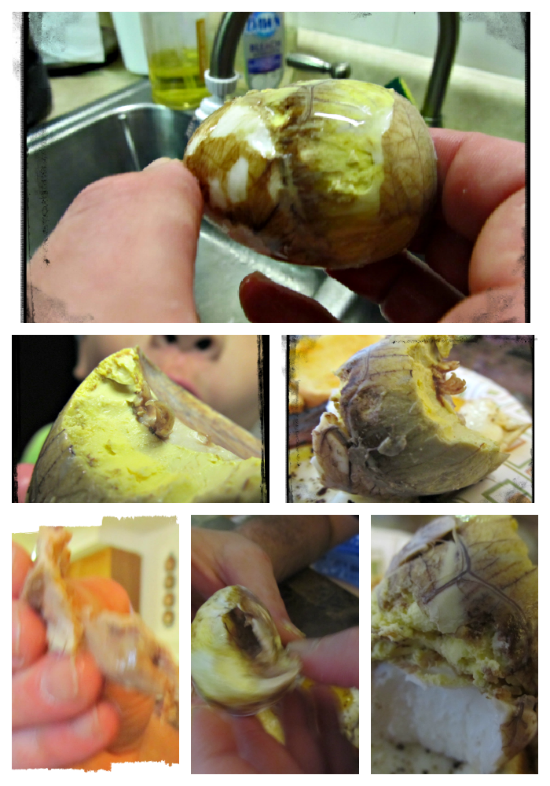 Balut, the looks of it, can be very deceiving. I agree with you guys that the looks of it can make yo go ew and yuck. It was even considered a challenge food for FEAR FACTOR contestants before (that’s how extreme this food is). But trust me, the taste of it is really amazing if cooked and done the right way. =) . Maybe I will try it some day Ron, but it is going to take a lot to work up to it…. Let us know Lisa when that day comes. =) . Promise, it’s worth a try. NO! never ever would I even tough one of those. UGH! NO! But my husband and two oldest boys would for sure! I know i could never be on Fear Factor because I just can’t stomach that kind of stuff. You know, I love eggs but that would be a big fat no! No. Just no. Oh and ick. They certainly are off putting in appearance and even if they taste like regular eggs I would have to decline. Some people will eat anything. I don’t think it is any more cruel to eat than a regular hard boiled egg but it is certainly alot more unattractive and unappetising. Give me a pickled pigs foot instead any day. I so wouldn’t eat it!